Somehow, luck has been against me from the start. Firstly, starting my 100 films with the third of a trilogy (there is no respectable fourth I know of) was plain weird, unsettling. Secondly, IMDb’s #100 ranked film is perhaps its most easy to watch, but also one of the hardest for me to write about. There’s no literary angle to analyse, despite its pretences to archaeological context, so I’m out of my comfort zone already. To be honest, when you see that George Lucas was involved in the scriptwriting, your hopes for any linguistic ingenuity wither rapidly. I guess it’s best I just embrace the Hollywood. This film is generally said to be a deeper insight into Indiana’s past. True, the ‘prologue’ was fun but you can hardly claim it did anything more. It’s amusing to think of a young Indiana, and I’m reliably informed that the resultant series was “epic”, but that doesn’t cover the fact that this film is all frivolity. It might be a Spielberg, but it’s no Schindler’s List. But then, it needn’t be. If every film was of that calibre we’d all have slits down our arms. Life needs its laid-back laughs, and that’s exactly what we get. Plus, there are lots of Nazis killed. That’s always a bonus, right? My film buddy for this instalment was one Tom Potton, who brought to my attention the hilarity of Nazi deaths. We’re allowed to laugh; they’re Nazis. There’s no other group we are so widely encouraged to marginalise as the Nazis. It means lighthearted movies such as this can be laden with violence, and it’s totally fine. They’re Nazis. Of course, lots of people die in James Bond films and we don’t care, but that’s because he’s defending good old Blighty. When you’re killing people so you can steal their stuff and put it in a glass case, they have to be Nazis. For most of the film I was thinking ‘that just wouldn’t happen’. A boat grazes another; it explodes. A stick gets lodged in a motorbike’s wheel; it flips, then explodes. Take the overly informative enemy, or the convenient placement of getaway vehicles/steeds, or Dr Jones’ partiality to kill everyone in sight to procure an obscure artefact while somehow remaining the good guy. These things just wouldn’t happen. An extreme detachment from any sense of reality is required to enjoy this movie. In fact, buy yours a passport. I should probably stop complaining though. We wouldn’t get as many explosions otherwise (and there are so many, joyously). Besides, we want ridiculousness sometimes; why watch films that show your daily life? You might as well play The Sims. Shudder. So, overall? 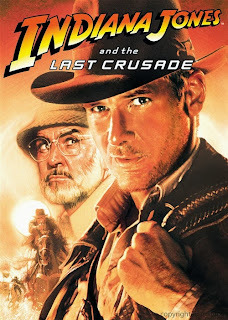 Indiana Jones and The Last Crusade is a great watch, but not exactly a great film. Cinematically there is nothing new, though there are some great settings (good job location-finder). The car chases, or variations thereof, and the action sequences in general are mediocre and predictable. My main complaint? That zeppelin was freaking asking for it, and not a lighter was sparked. P.S I know this isn't structured too well but oh well. P.P.S I look forward to reading this list and trading viewpoints.